When you live in near-blackness at the bottom of the ocean, you can't rely on plants to turn sunlight into food for you. 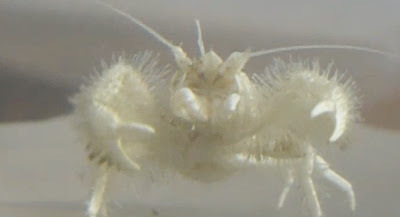 The yeti crab, a pallid creature with woolly arms like an ill-conceived Muppet, eats bacteria that subsist on chemicals leaking from the seafloor. To keep things close to home, it gardens those bacteria in the lush fields of its own hairy forelegs. Yeti crabs were first discovered in 2005, when a single representative of the species Kiwa hirsuta was dragged up from the ocean floor. In a new paper, Andrew Thurber from the Scripps Institution describes a second species of yeti crab. Researchers found clusters of Kiwa puravida crabs around methane-leaking seafloor cracks near Costa Rica. Like uncool concertgoers, the crabs were waving their arms rhythmically back and forth, as you can see in the video below. These crabs, like the yeti crab discovered earlier, had a healthy population of bacteria living on their arms. Since some other invertebrates living around ocean vents are known to grow symbiotic bacteria on their bodies, the researchers investigated whether the yeti crab's bacteria were there for a reason (other than poor hygiene). Circumstantial evidence suggested that the yeti crabs were not just tolerating their arm bacteria, but eating them. For one thing, scientists didn't observe the crabs scavenging, or attempting to eat any of the shrimp or other creatures sharing their ocean vent. For another, the crabs could be seen combing through their arm hairs with appendages by their mouths--then munching on what they found there. Applying the principle that you are what you eat, the researchers analyzed fatty acids in the crabs' tissues and found a molecular signature matching their arm bacteria. These chemical-consuming bacteria seem to be not just a snack, but the primary food source for K. puravida. As for the swaying behavior, Thurber guesses that it keeps a steady current of mineral-rich water flowing around the bacteria. Like farmers tilling and watering their fields, the yeti crab dutifully tends its crop by waving its bristly arms. And at harvest time, it doesn't have to take a step. That's pretty practical for a crustacean named after a mythical creature. Image and video: Thurber et al., supporting information. Watch the video of a yeti crab eating its arm bacteria at your own risk. Fortunately, the Internet has come to set this egregious slight on yeti crabs to right. Behold the wonder that is the #DancingYetiCrabs playlist! You're right; they do look cooler with a soundtrack!